For a musician who got his start "screaming his head off and stomping on distortion pedals" in a geek/punk band, Dave Hadgkiss has done a musical one-eighty on his debut album as Folk Thief. There is not a punk sneer in sight on this intensely personal collection of ten tracks of strumming guitar and heartfelt words. But while Love, Heartache & Oblivion is earnest and forthright, unafraid to wear its heart on its sleeve, there is a complexity to the human emotions that are stripped bare in these songs. Often dark, always haunting, this album digs deeply into what drives the human psyche. Sometimes joyous but often tortured, Love, Heartache & Oblivion is a folk-pop exploration of love and loss, dreams and fears, hope and regret. Instrumentally, these songs are a lesson in restraint, lyrically they are visually evocative dream-poems. Particularly strong are the tracks Broken Record and Breathe, which feature some truly lovely background harmony by Kelly Haigh. Her voice works well with Dave Hadgkiss' yearning vocals, and the two meld into a nicely layered sonic counterpart to the stripped-down acoustics. Love, Heartache & Oblivion is a strong debut album from Folk Thief. It will be interesting to see what he does next. 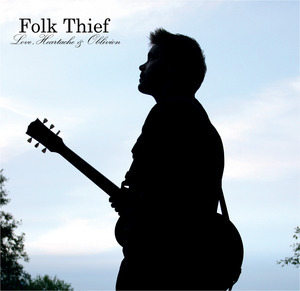 I like that album name, Folk Thief. When my new music pile starts to lessen I'll be sure to give this a listen! It's a pretty evocative name for a musician, isn't it, Al? I do know what you mean about the music piles. Isn't that a great problem to have?